Remember my review on Guerlain Cruel Gardenia? If not, please just scroll down a bit and you will find it. The flower I was longing to embrace and call my own in that fragrance - majestic gardenia - eluded me. Fret not! I have found a white floral, fresh, green and gloriously gardenia-esque fragrance to place in my line up for spring. It is Bond No. 9 Central Park West! The notes as listed by the house describe narcissus, ylang ylang and pepper at the top with orris, jasmine, linden and gardenia at the heart. The base offers vetiver, musk, white oak and treemoss. While I would love to say that I detect every note, I cannot tell a lie. I do not. Ylang ylang holds a place in my heart for its grounding qualities and it is most certainly here. Jasmine makes a demure (not overly sensual) statement and narcissus does too, in a rich and green fashion. However, the star of the show and the one to whom all applause should be directed outshines the other notes and does so in the most realistic, beautiful, fresh and inoffensive fashion. Gardenia! Richer and more attention-grabbing than Kai, less sharp than Chanel Gardenia and everything that Guerlain's gardenia offering was not, Bond No. 9 Central Park West offers a stately, grand white floral entirely based on gardenia. I have found after sampling my entire sample vial for days that this fragrance just makes me happy. I want to wear bright colors, dab a tiny little bit on the nape of my neck and prance and twirl like my three year old daughter. 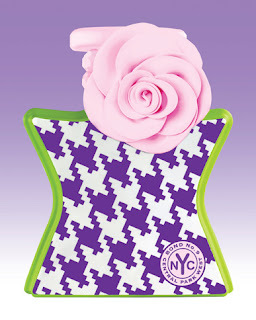 To reference the name of the fragrance, perhaps we could prance and twirl happily in Central Park together. I adore the bottle design with a very appropriate large pink flower flanked by strung beads at the neck which cleverly detaches as a bracelet. The rest of the bottle is decorated by a bold houndstooth check pattern. 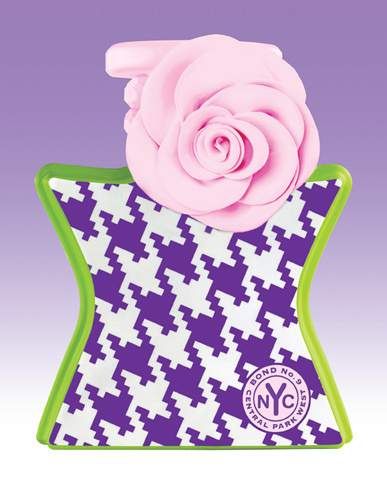 Central Park West is entirely appropriate for daywear when worn sparingly. Do not douse. This fragrance is ostentatious enough to fill an entire room! I imagine a full bottle will last for years and I see its purchase in my near future. Bond No. 9 Central Park West is available at Bond No. 9 stores and Saks Fifth Avenue. A 100ml bottle retails for $250, a 50ml bottle retails for $180, Body Silk retails for $180, a candle for $130 and shower gel for $75. So far from what I have seen, this one and Chniatown are two of Bond No.9's best fragrances! I gotta see what the fuss is about with this line! I Just ordered 20 something samples, so I plan to be having a frenzy with these shortly. (going to make the addiction even worse) But oh well, what to do! Enjoy exploring this house Joshua! I am a fan of West Side, Scent of Peace, and now Central Park West. I look forward to hearing your favorites after your sampling frenzy.